A damning jeremiad on how modern public policy can be exploited by corporate chicanery. Journalist and national radio host Rabin-Havt (co-author: The Fox Effect: How Roger Ailes Turned a Network into a Propaganda Machine, 2012, etc. ), in conjunction with news watchdog Media Matters for America, digs deep to reveal a consortium of manipulators bent on undermining beneficial organizations and causes with manufactured misinformation. From the initial pages, the author blatantly skewers controversial public relations guru Richard Berman as a smear campaign propagandist. 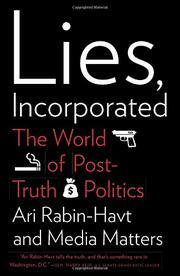 Rabin-Havt proceeds to systematically compile an incriminating dossier of lobbyists, propaganda spinners, unethical authorities, and “unscrupulous think tanks,” collaboratively known as “Lies, Incorporated.” These groups channel misinformation and generate public confusion around the most controversial hot-button issues surfacing during the Barack Obama administration. In a narrative that is far from sour-grapes disparagement, the author provides meticulous research and evidentiary support backing claims of these groups’ corruption dating back to their inception in the early 1950s when a shady syndicate of tobacco industry titans disseminated falsified information about the risks of cigarette smoking. For every crucial issue that surfaces, a corporation’s interests appear directly threatened by its exposure, the author implies, and desperate measures are taken by appointed spin doctors to skew semantics and twist reality for the sake of profit. With succinct clarity, Rabin-Havt demonstrates that statistics on climate change and global warming are continually challenged by the oil industry, just as efforts to promote comprehensive immigration reform, affordable health care, gun control laws, abortion rights, and gay marriage have all been continually contradicted by opposing factions propagating critically damaging misinformation. But the problem seems to have spiraled out of control. This is most obvious in the book’s closing chapter of remedies to “weaponize truth” by “demanding transparency from elected leaders as well as the media.” While galvanizing and optimistic, these solutions require major cultural shifts and, alas, appear to be as complex as the problem itself. Powerfully crafted accusations sounding the alarm on an insidious trend in political manipulation.